The final draft of your research paper/journal article, will be submitted as a hard copy. What appears below is an example of what your final draft should look like. The content of the draft below is irrelevant. In fact, the content of the chapters below is not related from chapter to chapter, and in some cases, the content is incomplete. What is of interest to you is the layout and overall organization of the document. Testing can cause stress, and according to Klick (2014), students with higher stress levels had heart rates of 67.30 beats/minute while students with a lower stress levels had heart rates of 65.54 beats/minute. People are taking tests everyday. Some are being timed and some are not. The goal of this research is to determine how timed tests affect heart rate. In answering this question, we may be able to help teachers have a better understanding of how testing conditions can impact a student's level of stress and performance. In doing this, we may be able to assist teachers in creating more appropriate testing environments. Does limiting the time allowed to take a test raise a person's heart rate more than if they were taking a test with no time limit? If it is true that being timed on a test has an effect on your heart rate, then when two groups of 10 middle school students are given the same memory test, but with one group being told they have as much time as needed to complete the test and the other group being told they have 5 minutes to complete the test, ​the group that has a time limit will score significantly different from the group that does not have a time limit. 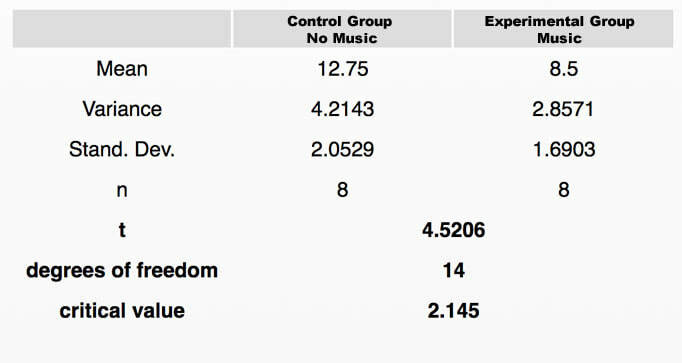 The independent variable for this experiment is whether or not the subjects listened to music while memorizing the list of nonsense syllables. The dependent variable for this experiment was the number of nonsense syllables the subjects are able to recall and write down on an answer sheet. Based on our results, we reject the Null Hypothesis (H 0) and we accept the Alternative Hypothesis (H 1). Listening to music while studying does seem to have a negative impact on learning. There are many possible reasons for this negative impact on learning. Music could disrupt the learner's concentration and make it more difficult for them to... Music may also... Finally, music may play a role in ..
Palmer (1996). Music and Learning.